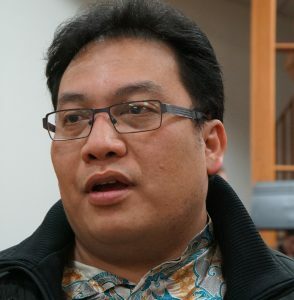 Indonesian expatriates say the support and prayers of the Edmonton Christian community helps ease their minds amid reports of church bombings and closures, desecration of tombs, and arrests in their homeland. 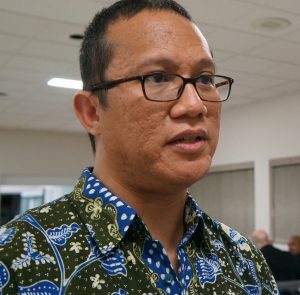 “We have the law but sometimes remote areas are not easy to control or monitor,” said Rey Situmorang, a member of the Indonesian Christian Fellowship in Edmonton. 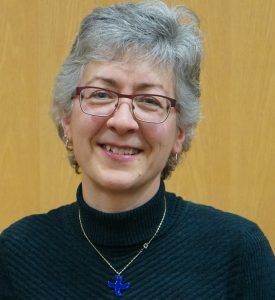 “Justice, and only justice, you shall pursue,” is the theme for the 111th annual Week of Prayer for Christian Unity, which is celebrated in Canada from Jan. 18-25. 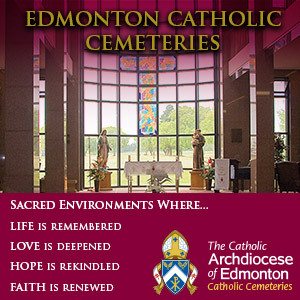 In Edmonton, the week was marked with an ecumenical service Jan. 20 at St. John Bosco Church. Archbishop Richard Smith was joined by Bishop David Motiuk of the Ukrainian Catholic Eparchy of Edmonton, and priests and faithful from the Anglican Diocese of Edmonton, and Pentecostal Assemblies of Canada at the event. The Week of Prayer theme is chosen by Christians in a different country each year and serves as an invitation to pray for the unity of all Christians around the world. This year’s theme was chosen by Christians in Indonesia. Indonesia has more than 261 million people. An estimated 90 per cent are Muslim, with Christians, Hindus, and other religions accounting for the remaining 10 per cent. Nevertheless, Erwin Simanjuntak said Indonesians of all faiths lived in harmony before the last 10 to 15 years, as Christianity gained more of a following in the world’s largest island county. In Edmonton, more than 800 people claim Indonesian heritage. The Indonesian Christian fellowship has about 100 members from different Christian denominations, including Alliance, Catholic, Baptist and Lutheran Christians. 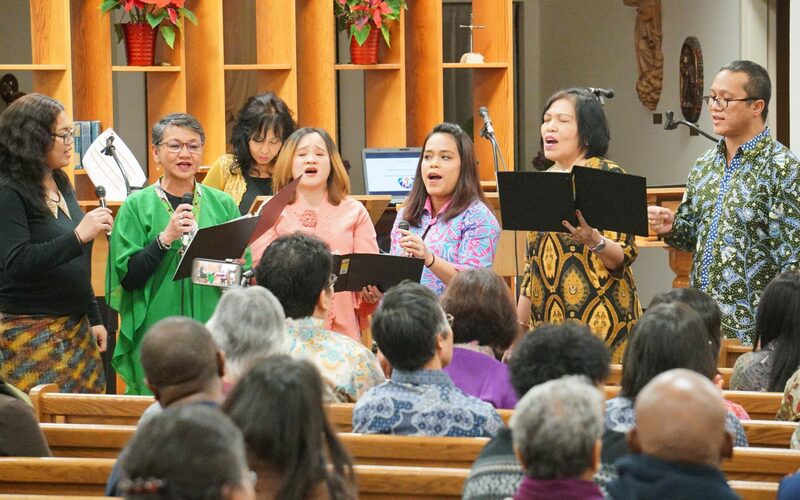 Indonesia Bagi Kemuliaanmu (Indonesian Fellowship Singers) provided music ministry at the Christian unity service. Situmorang, who played guitar and keyboard at the event, said the Indonesian choir welcomed the opportunity to promote love and unity amid the pain and political unrest in his home country. The choir’s contribution featured Indonesian dance and the smooth piano-like sound of the traditional Javanese Gamelan percussion instrument. Composer Sheyla Benjamin wrote the song in response to the persecution of Christians in Indonesia. “As people of faith we need to support each other and to support anybody who has any kind of faith,” said Kruszewski, who led the ecumenical Taizé prayer ministry at the service. Kruszewski, a member of Assumption Catholic Parish, was presented with the Rev. Marilyn McClung Memorial Award at the service, for her ongoing contributions to Christian unity, including leading singing at Edmonton’s annual Outdoor Way of the Cross event. The Outdoor Way of the Cross is an ecumenical event modelled after the popular Christian devotional that marks Jesus’ last hours before his crucifixion. “We don’t do enough ecumenism in our world. and I think it’s always wonderful when we do get together and celebrate together,” Kruszewski said. St. John Bosco Parish was chosen as the venue for the service because of its “beautiful ethnic and cultural diversity,” said Julien Hammond, coordinator of the Archdiocese of Edmonton’s Office of Ecumenical and Interreligious Relations. “It embraces an ecumenical spirit and it embodies the biblical theme chosen for this year’s World Day of Prayer for Christian Unity: Justice, and only justice, you shall pursue,” said Hammond. That theme was highlighted by Edmonton Archbishop Richard Smith in his homily.